Strangely enough the beach this morning reminded me of Saudi Arabia, almost thirty years ago, with the bright sunlight and the waves breaking gently on the rocks. In those days, we would wade out and drop over the coral reef into the deep water beyond and explore incredible diversity of marine life that waited for us offshore. There was a time even when I used to dive on my own from time to time between St Mildreds Bay and West Bay on those unusually clear days that happen a few times each year but being hooked by an enthusiastic promenade angler one fine day, soon put me off the idea and I'm sure the seals keep their distance too. 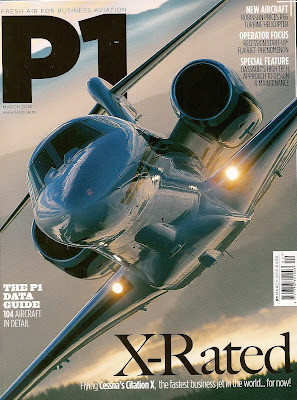 Better late than never, I see that my feature in P1 Magazine has appeared, taking a Gulfstream jet into Milan's Linate airport in September. It was held over from the November issue but I'm quite pleased with the result and it's one-up from 'Top Gear' as the engines involved are a little larger and the top speed even greater too. Watching another jet from my window, descending into the Manston circuit, I reflect how pleasant it must be to be able to afford such an incredible runaround, which shrinks the world to a comfortable few hours nap in any direction comfortably settled in a mahogany and leather-lined cabin and without the inconvenience of having to pass through and suffer the necessarily tedious extremes of airport security like everyone else. What a great way to visit South Africa for the World Cup, so keep buying those Euro Millions lottery tickets I suppose!